All online courses are assigned within 24 business hours from ServSafe.com. If you do not see instructions in your email inbox please check your spam/junk folder. The Watertown, MA ServSafe Alcohol® Online Course and Primary Exam provides the fundamentals of responsible alcohol service by combining interactive exercises, audio and video and role-play activities to help prepare participants for real-life scenarios. Designed for convenience, this mobile enabled four-hour course has a bookmark feature that allows users to easily return to where they left off. 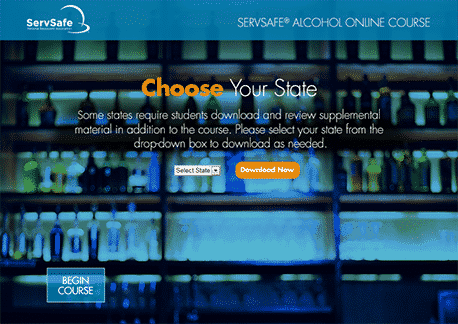 FOR ILLINOIS USERS: The ServSafe Alcohol Online Course and exam is BASSET approved for online and classroom delivery. Students will receive both a ServSafe Alcohol Certificate and the BASSET card. The BASSET card will be mailed directly to the student from the Illinois Liquor Control Commission. Find out if you can take ServSafe Alcohol Online in your state. Download the State Implementation Guide for Responsible Alcohol Service for your state. You will have 90 days from the start date to complete the course. The course will expire one year from the date of purchase. Upon purchase, a Exam Access Code will be provided in an emailed receipt for each course purchased. After completing the course, choose either the English or Spanish primary exam, then enter the Exam Access Code included in your receipt to begin the exam. This entry was posted in Class Notices and tagged Alchol Service, Alcohol Seller, Alcohol Server, MADD, ServSafe®, TiPS. Bookmark the permalink. © 2017 HRBUniversal LLC • ALL RIGHTS RESERVED.